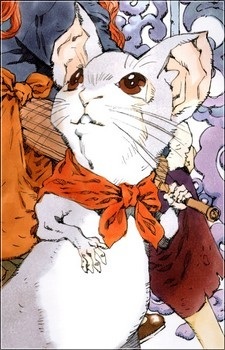 Rakushun is a hanjyuu with the form of a rat. Though Youko is initially distrustful of him, he becomes her first good friend after she is taken from Japan, after managing to teach some essential skills to Yoko about life. Rakushun is proud of being a hanjyuu and is somewhat uncomfortable in his human form; Youko only learns that he could appear as a human after quite some time. He is very intelligent and knowledgeable and enrolled in the Daigaku of En. Youko wishes him to teach her about the politics and customs of the world.